Did you think that the most expensive bottled water was to be found in desert areas? So did I, until I discovered Bling H2o, which is nothing but water, packed in plastic or glass reusable bottles decorated with Swarowski cristals. Priced between $20 and $550 (depending on the bottle type and of the pack size), this spring water from Tennessee is the latest fashion amongst Hollywood celebrities. On the Bling H20 website, we can read that “it is a couture water that makes an announcement like a Rolls Royce Phantom.” The producer claims that they use a “nine step purification process that includes ozone, ultraviolet and microfiltration”. Honestly, I did not understand how these nine steps are to the benefit of my health, but I suppose that drinking Bling H2o while jogging in the park increases the risk of robbers attack, so I’ll refrain from buying it until I move in a safer area (maybe Hollywood would do). 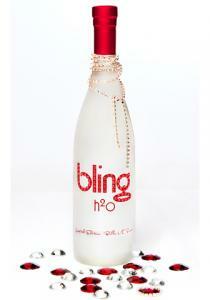 Rumours have spread that Paris Hilton buys Bling H2o for her dog. Luckily my cat cannot read English, otherwise I’d be in trouble if she wanted to feel like Paris Hilton’s dog. How could I explain the poor kitty that she’s not a dog and I’m not Paris Hilton? If you show this article to your Alaskan Malamut, or Golden Retriever, or any other dog breed, please don’t blame me if you’ll have to buy more dog training sessions to get this water out of your dog’s mind. Mkay. That is definitely something I would never pay for! And you do not have to understand how the 9 purification steps help you! You only have to hear about them and believe in its absolute purity. Simply because they’re 9…Sad, really! I believe you, Alina. It’s sad, but true. I know at least two persons who would buy that. Tennessee spring water? Are you telling me I could set up shop in my Tennessee back yard and start selling spring water to Paris Hilton? What a sad news for ordinary people!